Happy Monday morning!! I am sharing this week’s post today instead of Friday so that you will have the opportunity to use it before the big game! Marie Fisher has shared a fun activity to incorporate the Super Bowl into a lesson for kiddos with more complex communication needs. 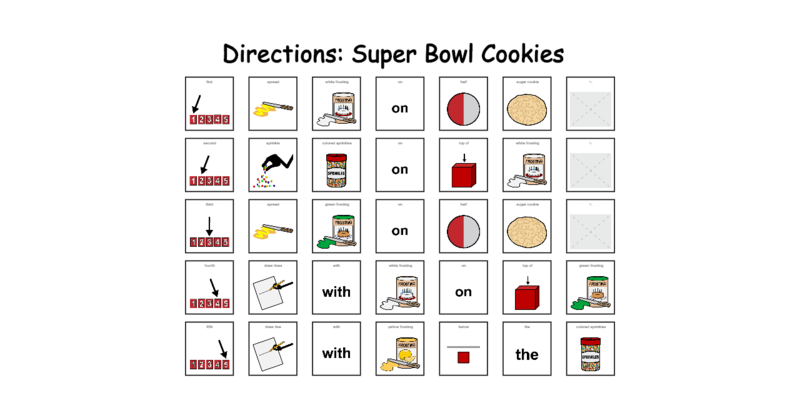 I thought I would share an activity I did last week with my students at Atherton who primarily use AAC. I originally got the idea from our blog — Super Bowl Stadium cookies. I made some visuals and templates that coincide with a current News-2-You article about the Super Bowl. The “core words” board seemed to be the most functional with those students using the dynamic display devices. The students practiced structuring 1-2 word phrases using these core words on their own devices as we made the cookies. Just a side note from me: It is fantastic to see people using blog posts as a spring board! Marie has taken an idea from Jessica’s previous post and expanded on it to create an activity that works for her kiddos! I am so excited that this has created a connection without us all having to be in the same place at the same time!! If you have used and expanded on an idea from a previous post–return the favor! Send your ideas this way so that everyone can benefit!! Keep it up!! 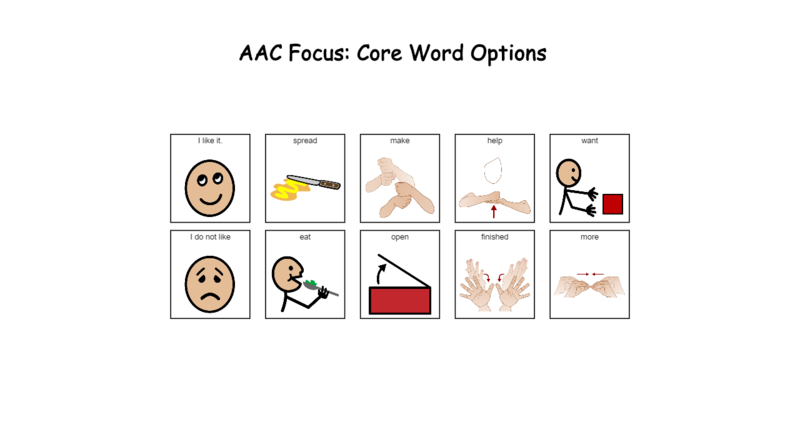 I am using EET and it is helping my students with fluency and language disorders with getting out their thoughts. I’m using the cards that came with the kit for my language students that have difficulty with expression. For my fluency students, we have been describing characters from movies, books, cartoons, etc. One of them even offered to describe me (which was scary but came out ok). They are also using it to write down their thoughts from a topic I give them, then to verbally present to the group using fluent speech. Included in the kit are photo cards of items. I started out with those, having them use EET to describe them. I think someone sent an email or posted on the Blog about the Monsters, Inc. movie and there were pictures of the characters on a worksheet that also had lines and a dot for each EET category. (Can be found here) We used those as a writing activity and the fluency students were instructed to write a complete sentence for each. It was easy for them because they could refer back to the dots and begin each sentence with the carrier phrases: Green Group- “It belongs to the _____ group, Blue Do- It ______. This helped them get their thoughts down on paper before having to present it verbally. They were more at ease and experienced less dysfluent speech patterns. Welcome to JCPS SLP online book club. We will be reading The Reason I Jump: The Inner Voice of a Thirteen-Year-Old boy with Autism by Naoki Higashida. If you are interested in participating in the book club this go-around you should check it out! Just like last time, this book club will operate a little differently than traditional, meet-once-per-week book club! We will check in once per week, but you will do it via the blog! Each week (the posts will publish on Wednesday mornings) we will cover 1-2 chapters from the book. One person will be responsible for putting together a reflective post for the chapter(s). It does not have to be extremely long or in depth, it just needs to be reflective of what you read. In your post, you should include questions and statements that provoke discussion among your fellow book club members. Book club members will then post comments and or questions about their thoughts on the chapter and questions posed in the post. Each person must sign up to compile one post (covering 1-2 chapters). This post will need to be submitted by the Monday before at noon. Each person must make at least 5 comments throughout the course of the study. You must log on and read the post each week, even if you choose not to comment on that particular post. If you meet the minimum requirements, you will earn 3 hours of PD credit! And you can do it all at home in your bunny slippers!We will start with chapter 1 on 2/8/17. This will allow you time to get the book and get started reading, but also allow us to complete the study before summer break! This is a great opportunity to earn credit, connect with other SLPs and enrich your practice through learning about the perspectives of others! If you have questions or comments, please leave them below! If you are wondering, someone else probably is as well! Please let me know if you are planning to participate by sending an email to: Kinsey.chambers@jefferson.kyschools.us by 2/1/17. Also, if you have a request for the chapter you would like to post about, include that information as well. I know we have been on an EET kick for the past several weeks, but people who received the kit through last year’s Crusade grant were asked to send in information about how they have been using their kit. They have submitted such great information, it is too good not to share! Today we will hear from 2 SLPs about their different methods and results with the EET kit. All of my students have learned the Expanding Expression Chant. 85% of them can say it on their own. We use lummie sticks to put the chant to a beat. They LOVE this. They have learned the individual descriptors and can state those attributes in isolation (i.e group, parts, do, etc.) and with question prompts with at least 80% accuracy for my older students (2nd and 3rd grade). They are struggling with stating critical attributes without question prompts. Some will look at the chart for a visual cue but I still get functions primarily. When they use the describing rope (that’s what we call it), they do better but it is SLOW going! I have been using EET with my elementary and middle school aged students. My elementary students love to sing the chant when they come into my room. I have a 4th grade student that has been working on labeling specific attributes to describe given vocabulary words- this student always had difficulty generating specific details. Now that I have incorporated EET into our sessions, this student is able to go through the chant and is more successful at labeling specific attributes for a given vocabulary word. I had another student (3rd grader) that was working on formulating categorical labels for presented items. He demonstrated difficulty formulating names on his own and consistently required visual cues to formulate names. After using EET, the student said “I get it now!” and is much more successful in labeling categories for presented objects/vocabulary. For my middle school aged students, we have used EET to describe/define science and social studies vocabulary. The students work together to label each component of the EET to define given content vocabulary. The students search the unfamiliar terms on the internet to help fill in components. Have you had similar experiences using EET? Do your activities and or results resemble one scenario more than the other or have you seen similarities to both? Maybe you have had a completely different experience? Please share in the comments below! 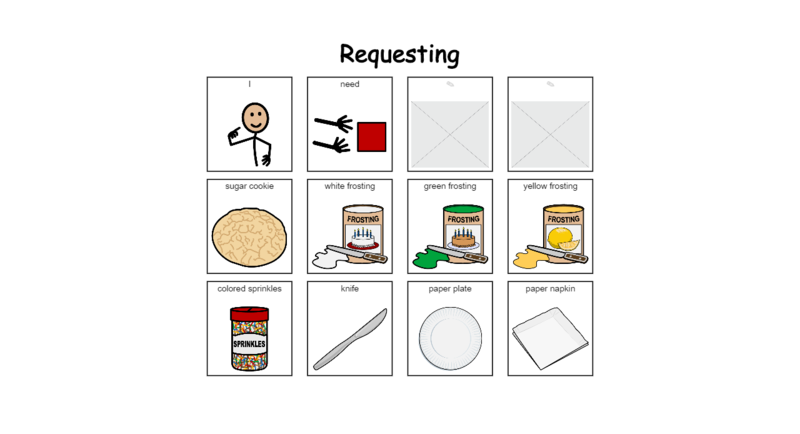 Today Allison Wahl shares some great ideas for using EET in therapy! I love using my eet kit in speech. All of my kiddos have the chant memorized and it really has improved their ability to describe classroom vocabulary words. I have eet signs posted in my room and the visuals really help the kids as well. Here is a graphic organizer I use with them as well. 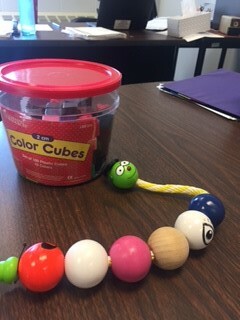 I use the color cubes to hand out to kids as they are describing. 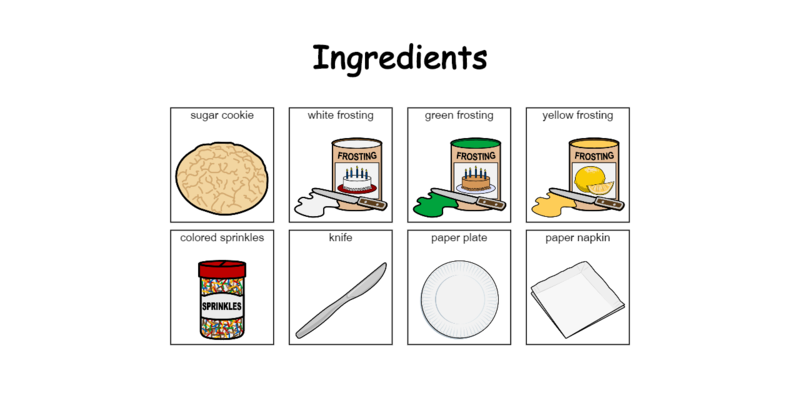 Today I have an EET activity for older kiddos from Marie Fisher. She uses these activities with middle school students, but similar activities could be used with higher grade elementary school students as well! Students are asked all of the time in middle school to compare/contrast ideas, stories, characters, etc. The EET provides a way for students to organize their thoughts to write cohesive paragraphs comparing/contrasting the ideas presented to them. Here is the simple graphic organizer with the 7 colored circles on it. I have my students draw a line down the paper and fill this out for whatever two stories/ideas/characters they are observing. Next, I have them organize their thoughts into a Venn diagram. The Venn diagram provides an organized picture of how they can structure their paragraph in order to compare/contrast. I have had great success using the attached documents for this objective! I have also attached a visual support that explains the way that I use The EET to help create a summary. Some of the teachers at Newburg have even asked me about this strategy so that they can incorporate it into their Language Arts classes!